A free 10 minute lesson for all rentals 1 hour or more. Even if you are not opting for a full lesson, we will go through the key skills needed so you can get the most out of your time on the water. Concession card holders enjoy discounted rate of $16 per session! Take a board away for a day trip or multi-day adventure! All Concession Card rates apply for use by one person. At Mission Bay we use top quality Stand Up Paddleboards in our fleet. 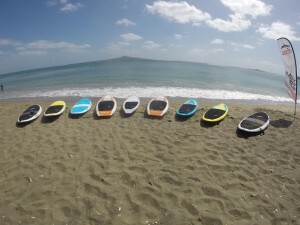 We are the only International Surfing Association Certified SUP school in the central Auckland where every instructor is an ISA qualified SUP Instructor.